With three out of four sets of comments in my possession, I plan to start going through the manuscript again this weekend to respond to the suggested changes and to make any other needed adjustments while waiting for the last set of comments to come in. With luck and a bit of work, I will release the book in time for the Christmas holiday—or at least early in the new year. Stay tuned not just for publication information but for news of sales on the earlier books as the release date approaches. Meanwhile, I have completed three full drafts of the last Legends novel, The Shattered Drum (Legends 5: Center). That too is in the midst of a read-through, because I have reached the point where I can’t see what problems remain. Although all the Legends novels intersect to some degree, the last two have particularly close ties, so it makes sense to discover what needs to be done on Legends 5 before letting go of Legends 4. I hope to have the complete series available in print and as e-books by the end of 2018. So what’s next? As I mentioned in a previous post, it’s not easy saying goodbye to characters I have come to know and love over the course of a decade. So although I’m taking a step back from the principals, I am in the midst of crafting a new series, Songs of Steppe and Forest. Each of the Songs features a character who never quite received her due in Legends. Some were supposed to get their own novels but didn’t, mostly because the novels had grown long enough without them. Others I never intended to become more than secondary characters, but as my creations tend to do, after a while they acquired pasts and problems and attitudes that made them interesting potential protagonists. As seems appropriate as the stories develop, these somewhat familiar heroines will interact with members of the original cast, so that readers who fell in love with Nasan and Daniil or Ogodai and Firuza can find out what happens to them in the years ahead. And as always, I am collecting every appropriate public domain image I can find as mental fuel for the settings my characters inhabit. Some of them are in this post—small hints to what you can expect from The Vermilion Bird. Enjoy! I will have more news soon. 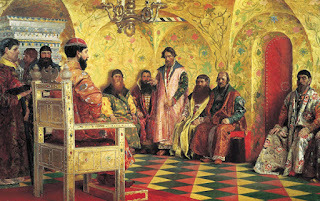 Images: Andrei Riabushkin, The Tsar Meeting with His Boyars (1893); Illustrated Chronicle Codex, The Wedding of Prince Andrei Staritsky, 1533 (late 16th century); S. M. Prokudin-Gorsky, Staritsa (1912). All public domain in the United States because of their age. Steve Wiegenstein, the author of three novels and a finalist for the first MM Bennetts Award in Historical Fiction in 2015 for This Old World, agreed to talk with me as he gets ready to release the third book in his Daybreak series. 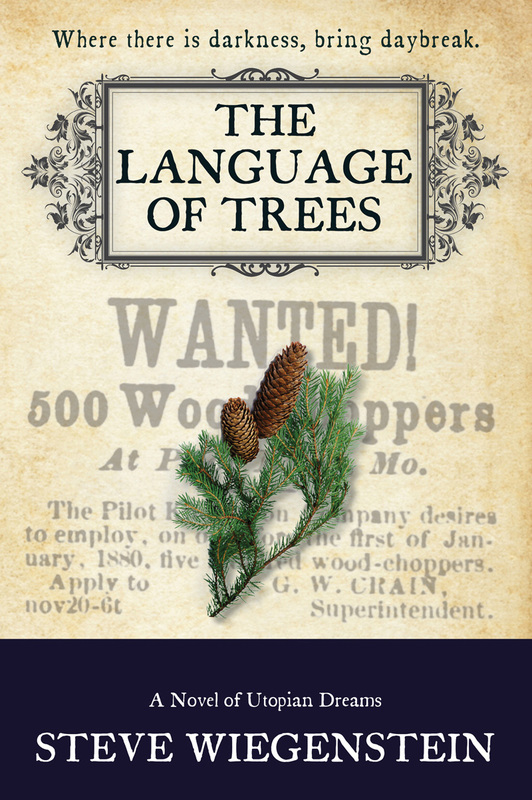 The Language of Trees comes out next Tuesday, September 26, and is already available for pre-order at Amazon.com (just click the link to find out more). And of course, read his answers below! 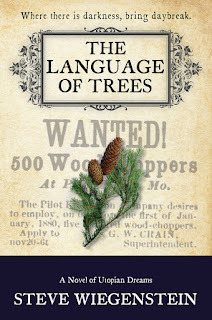 The Language of Trees is the third novel in your Daybreak series, following Slant of Light and This Old World. Could you give us a brief sketch of the background developed in those first two novels that will help readers approach The Language of Trees? The books interlock, but my overarching goal is to make each book a satisfying aesthetic experience in itself, so readers shouldn’t worry if they haven’t read the earlier ones; they can still enjoy the next one. That being said, here’s what happened in the first books. Charlotte Turner, along with her husband James, established the Daybreak community in the 1850s as an experiment in communal, egalitarian living on the order of Brook Farm and New Harmony. The colony attracts a wide range of idealists, but James’ personal failings reveal themselves as he develops autocratic tendencies and engages in an affair, which results in the birth of Josephine Mercadier. Charlotte emerges as the community’s true leader and manages to hold Daybreak together, but the coming of the Civil War sends the men off to fight while the women remain behind. After the war, James returns a broken man, but redeems himself by protecting Josephine from her violent stepfather, an act which results in his death. Charlotte, Charley Pettibone, and the other founders of Daybreak carry on. You live in the Ozarks. You have an active outdoor life and a teaching career. What made you decide to write novels—especially novels about a utopian nineteenth-century community? And having decided, how did you go about mastering the craft? My mom was a writer, and I grew up admiring the art. In fact, the romantic ideal of the journalist-turned-novelist, embodied by writers like Stephen Crane and Ernest Hemingway, is what led me into journalism originally. I wrote a novel in my twenties but it wasn’t particularly good—it was poorly crafted and written for the wrong reasons. So I became a teacher, all the while continuing my craft with a lot of short stories. I grew interested in nineteenth-century utopias because they represent the distillation of American optimism, and I’ve done a good bit of scholarship on them. Then one day in late 2006 the idea of combining my passion for fiction with my understanding of utopias, and setting a series of novels in my home region, came to me like a flash. I’ve been working on this project just about every day since. The Language of Trees brings to adulthood a new generation in Daybreak, which leads to a generational clash between the community’s founders and its heirs. One source of conflict is industrial development, which threatens the agricultural environment as well as the philosophy of the Daybreak community. What made you decide to explore this particular conflict, and what can you tell us about it as it plays out in your book? One thing I’ve learned about utopian communities is that communities founded by a charismatic or visionary leader rarely continue if that leader dies or becomes discredited. So I wanted to continue the story following the classic lifespan of utopias. 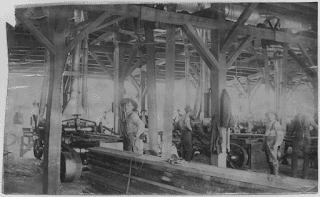 Also, the 1880s saw the real boom of the Industrial Age, when it seemed as though moneyed interests were going to overwhelm all other elements of society, and there were efforts to resist that seemingly irresistible force. Nowadays we remember that as largely a labor-movement and progressive government resistance, but there was also a rural-urban dimension to that struggle that I wanted to capture. So it’s a very rich time period for exploration, and one that tends to get overlooked or oversimplified. I really think that the urban-rural divide that is so prominent today has its roots in the coming of industrial methods to rural life in the late nineteenth century. Another one of those “understand the present by understanding the past” opportunities! As befitting a book about a communal utopia, your books trace the life of a community rather than focusing on one or two individuals. There are lots of point-of-view characters, who often see the world in contrasting ways. You do a remarkable job of keeping them both real and separate, but is it difficult to juggle so many different perspectives? It is, especially since there are times when several of them are in action simultaneously. I had to do a good bit of revision to make sure that I didn’t have a character in one place at the end of a day, and then magically appear in another place the next morning. But as you say, it’s the story of a community rather than an individual, so I thought that moving the point of view from character to character would be important in giving a sense of the totality of that experience. Flowing the action in and out of various characters’ minds is a challenge, but it’s also great fun! I hope readers will enjoy the ride. Do you have a favorite character and story? Charlotte Turner has been my favorite since the beginning of the series. She’s a character who just keeps growing and changing as the series develops, in ways that I would not have predicted at first. Non-writers sometimes scoff at our claims that characters can develop and change in ways outside our conscious control, but I’m here to testify that it happens. Charlotte is tough beyond all reckoning, but she also has an immense capacity for love that keeps her going on despite all the struggles that life has given her. As far as a storyline goes, I am awfully fond of Charley Pettibone’s. He started out in the first book as a goofy, illiterate orphan who more or less chanced into the community and who got caught up in the rush to glory that many young men experienced at the beginning of the Civil War. He came back from the war in the second book as a bitter, hardened young man who was at odds with everyone, but who discovered there were second chapters in life. And by The Language of Trees, he’s become someone who other characters look to for guidance. Of the various characters in the series, he may be the one who has grown the most. The fourth book in the series will take us into the twentieth century with a novel set in the years 1903–1904. That’s another endlessly interesting time period to me. Here in Missouri, it was the time of the Louisiana Purchase Exposition, better known as the St. Louis World’s Fair. What a fascinating event! Intended as a celebration of American technological and racial superiority, it also revealed deep splits in the national mind. As an Ozarker, I’m also piqued by that period because it’s about then that the word “hillbilly” first came into use and the popular image of the Ozarks started to take shape. Steve Wiegenstein was born and raised in the eastern Missouri Ozarks—his folks grew up on adjoining farms, and his family roots go deep in Madison, Iron, and Reynolds counties. He went to college at the University of Missouri. 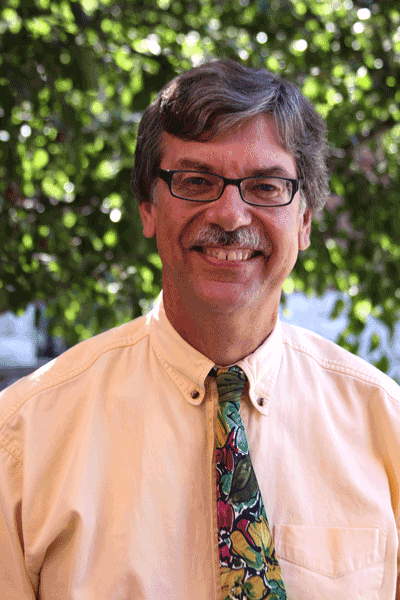 After a few years as a newspaper reporter, he returned to school and became a college professor. He is an avid canoer, rafter, and kayaker; a longtime member, friend, and supporter of the Quincy, IL, Unitarian Church; a fan of the St. Louis Cardinals; and a board member of the Missouri Writers' Guild. Learn more about him and his books at his website and blog. Image credit: “Men Standing in the Lumber Yard at the Ozark Lumber Co., Near Winona.” National Archives and Records Administration (NARA), no. 283583. 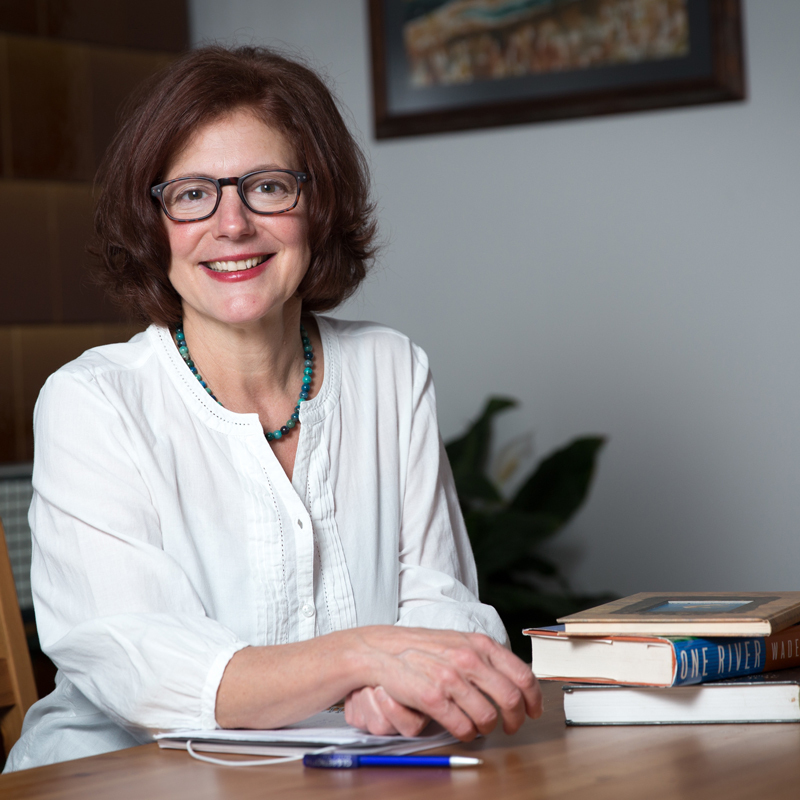 In a pleasant surprise, the wonderful production people at the New Books Network posted my interview with Joan Hess within twenty-four hours. Some of you may know Joan Hess as a prolific writer of contemporary mysteries, many of them featuring Claire Malloy and another series set in the fictional town of Maggody. But Joan Hess was also a friend of Barbara Mertz, the Egyptologist turned novelist whom I memorialized in “The Sands of Time.” In that post I lamented several characters whom Barbara Mertz created under the pen name of Elizabeth Peters: most notably, Amelia Peabody; her husband, Radcliffe Emerson; and their son, Walter Peabody Emerson, better known as Ramses. Well, it turns out I mourned their disappearance prematurely. As detailed in the interview, Joan Hess agreed after many refusals to take on the task of completing her friend’s final manuscript, about one-third of which Barbara/Elizabeth had finished before she died. 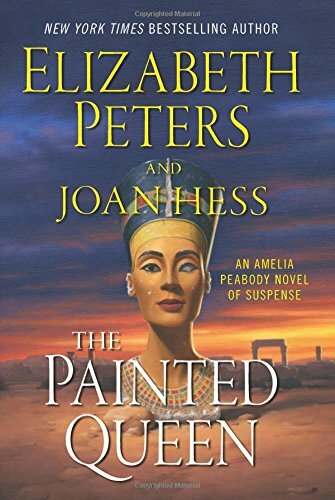 The result is The Painted Queen—a rollicking adventure in the true Elizabeth Peters style that mixes archaeology, criminal activities, murder, and a series of bizarre but engaging twists that involve monocles, camels, and a writer of bodice rippers. I understand perfectly why Joan Hess resisted the call. How do you finish another person’s manuscript, no matter how well you knew that person or how many scribbled notes she left (many of them illegible, it turns out)? 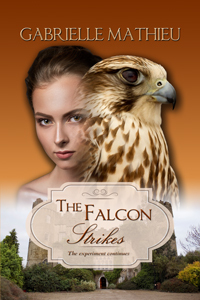 Each author’s style is her own, and if you write contemporary mysteries set in small-town America and your friend uses her vast experience of archaeological digs to produce books set in Victorian and Edwardian England and Egypt, that gap between approaches becomes enormous. As much as I enjoy reading the books that emerge from my writers’ group and coop press, I can’t imagine taking over sparkling holiday romances, edgy historical fantasy with a psychedelic twist, intense character studies of contemporary women’s lives, or the many other works that my friends regularly write. No doubt they would balk at finishing a book inspired by four decades of researching medieval Russia. Yet it’s to Joan Hess’s credit that she not only took on the project despite her doubts but completed it regardless of the very real stresses imposed by life. The Painted Queen is a beautiful tribute to a beloved author, but it is also a testament to the dedication required to write while mourning the friend whose work sits in front of you every day, demanding that you imagine how that friend would tackle the situations she created and how you can change things (because for sure, she would have changed things during the writing) to enhance the story without distorting its essence, to allow a large set of established characters to grow and develop yet remain true to themselves. It’s also a darned good story. 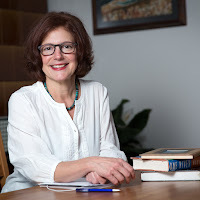 I learned a lot during this interview—about Barbara Mertz and her flagship series, of course, but also about the complexity of writing under a particular set of circumstances. Although I doubt I could have done the same, I’m very glad that Joan Hess did. In a small change from my usual style, I am reproducing only part of the post that first aired on New Books in Historical Fiction. I expanded the first part into the longer discussion above. In this last adventure, set in 1912, Peabody and Emerson have barely set foot in Cairo before the first death occurs: an unknown man wearing a monocle who collapses just inside the door of the bathroom where Peabody is soaking off the grime of her train ride from Alexandria. There is no question that the death is murder, and discovering the identity of the corpse, the reason for his carrying a card bearing the single word “Judas,” and the hand behind the knife that has dispatched the unwanted visitor consumes Peabody and Emerson even as they devote some of their attention to the excavation that has brought them to Egypt. The murderer could be the Master Criminal, defending Peabody from harm. Or s/he could be the representative of a secret society of monocle wearers, bent on revenge. As Peabody and Emerson, with help from the junior members of their extended family, strive to figure out what’s going on, they must also deal with less deadly intrusions from a missionary named Dullard and the ineffable Ermintrude de Vere Smith, writer of racy romance novels, as well as a disappearing archeologist and an apparently nonstop succession of forgeries purporting to be statues of Nefertiti—the Painted Queen. It all makes for a deliciously entertaining sendoff to a much beloved series, one that Peabody and Emerson fans should not miss. As I’ve mentioned in previous posts, no matter how hard historical novelists strive to portray their fictional worlds with accuracy, that goal is elusive. Readers usually blame the novelist for errors of omission or commission, and for sure some writers wouldn’t recognize research if it hit them with the proverbial barge pole. Others justify any stretching of the facts by citing the need to tell a good story. This approach, more than any other factor, explains the tendency among academic historians to sniff at historical fiction and those who produce it. But this response does not do justice to the many historical novelists who do try hard to avoid anachronisms, even in the speech and thoughts of their characters. Furthermore, it ignores an even more fundamental problem: the real gaps that exist in our knowledge of the past. In my interview a couple of weeks ago with Linnea Hartsuyker we talked about how remarkable it is that she can trace her ancestry through documentation back to the year 1000, although even in Norway most of our current information about daily life in the ninth and tenth centuries comes from archaeology, not documents. I mentioned then how impossible such a genealogical exercise would be in Russia, where even the earliest chronicles exist in thirteenth- and fourteenth-century copies. Only a handful of religious miscellanies survive from the Kievan period (862–1240 AD). The problems don’t stop there. 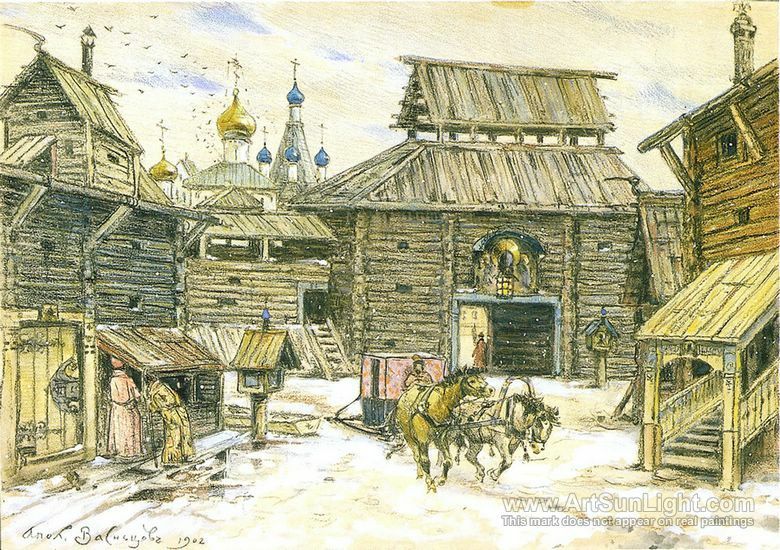 For obvious reasons, well into the sixteenth century (and up to the present in the rural areas that constitute most of the country) the primary building material in Russia was wood. That applied to Moscow as much as anywhere else, although the Kremlin acquired stone walls in the mid-fourteenth century and the familiar brick silhouette in the fifteenth. More and more churches, monasteries, and fortresses were built in stone or brick as time went on, and even the occasional domestic estate: the Old English Court and the house in which Tsar Mikhail Romanov (r. 1613–1645) was born are two sixteenth-century examples that have survived to the present day. 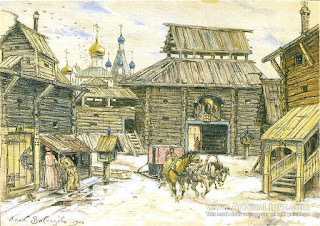 But the vast majority of dwellings and shops in Moscow were made of wood. As a result, huge fires swept the city every twenty to thirty years, consuming not only lives and property but records. Historians of medieval Russia struggle with gaps and losses in the documentation every day. So too do historical novelists. Take, for example, the Moscow Kremlin. 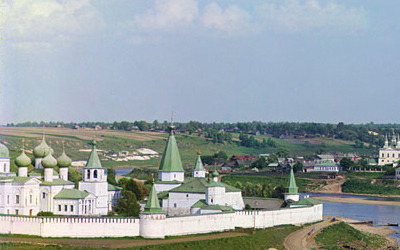 If any place in Russia should have a voluminous and relatively complete history, it is this one. Yet basic questions about what existed when remain unanswered. The historian who checked The Vermilion Bird (as well as The Winged Horse and The Swan Princess—I am deep in her debt) for errors of fact mentioned the existence of a shielded viewing area from which royal women and children could observe ceremonies in the Palace of Facets, the main reception area for Muscovite grand princes and tsars. We know it was there in the seventeenth century, because the mother and half-sister of Peter the Great watched plays in the Palace of Facets while hidden from view. It appears also to have been used as a musicians’ gallery. But did it exist in 1537? No amount of research and pleading on my part has so far answered that question. 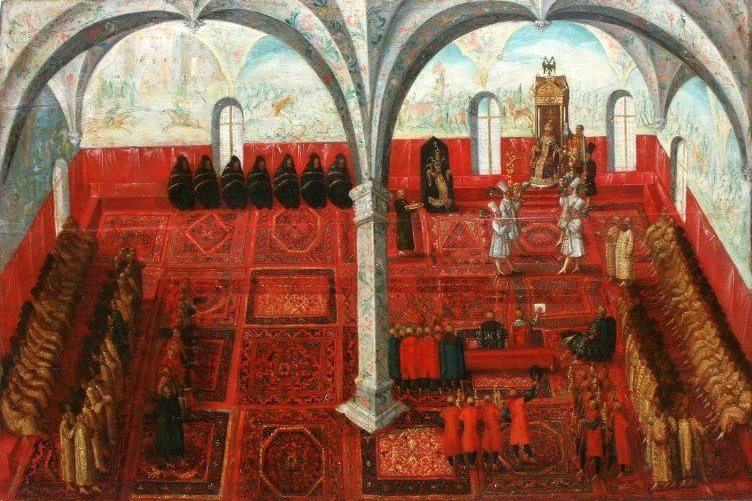 Although the seventeenth-century plays were a European import not known before the Time of Troubles (1598–1613), there were other reasons why such a viewing area might have been regarded as important in the 1530s: not least the dynastic reality that Grand Prince Ivan IV (later crowned as the first tsar and better known as “the Terrible”) had come to the throne in 1533 at the age of three, and his mother, although not a regent in the full European sense, had managed to overcome the many strictures on women and maneuvered her way into power. But even she could not receive foreign envoys or preside over meetings of the most powerful nobles, so she had every incentive to authorize the building of a structure where she could observe without being seen. In the absence of definite information I decided to use the gallery in The Vermilion Bird. It so perfectly solves a problem for that story, and the solution to that problem could only be manufactured in any event. So as always, I include a disclaimer in the historical note. It is the luxury of fiction, when history fails us, to invent this detail or that. But rest assured, I prefer the truth. I think many historical novelists feel the same. And many, many thanks to the historians who went out of their way to help me ascertain what that truth might be, even if in the end we had to conclude that the evidence just wasn’t there. Images: Viktor Vasnetsov, The Seventeenth-Century Kremlin in Moscow (1913), public domain via Pinterest; Szymon Boguszowicz, Reception of the Polish Envoys by False Dmitry I (1606), showing the interior of the Palace of Facets, apparently as viewed from above, public domain via Wikimedia Commons.